Located in Adamas, the port town of Milos, The golden sun complex is conveniently located just 300 meters from Papikinos beach, and a short walk from Adamas’s many restaurants, cafeterias and shops. This combination of privacy on one hand, and proximity to the beach and to the bulk of the island’s facilities on the other. This luxury complex will make you feel as if you are staying in a small autonomous village. Secluded yards around all of the rooms, small paths running around the tiny village, a central square for your coffee or breakfast and a small reception house with a stone oven and original, traditional furniture. This Hotel on Milos is situated in the picturesque village of Adamas, only a few minutes from the port and the tourist region of the island.It is only 50 meters from the beautiful beach of "Lagada", where the golden sand and the shallow crystal waters, make it ideal for family bathing. We would like to welcome you to our beautiful island of Milos and to NOSTOS Hotel.We hope that our warm and friendly hospitality, our premises decorated according to the Cycladic architecture and the quality services offered in our newly built hotel will become your most pleasant memories of your vacation in Milos. 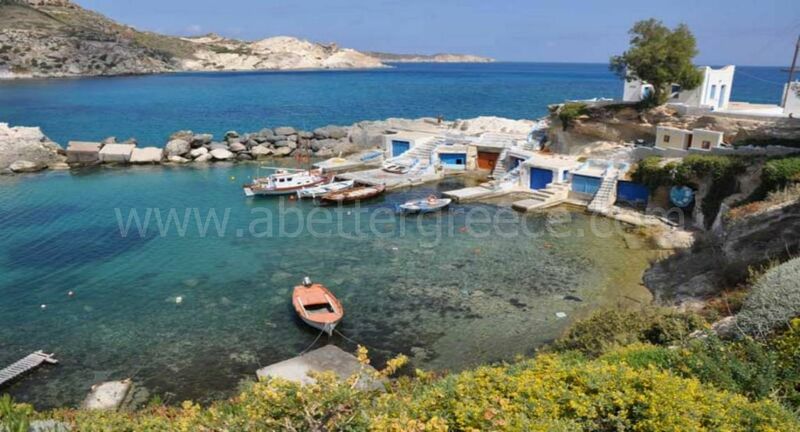 At a very convenient location, which combines easy access to the port of Milos Ilsnad as well as to the best local beaches and also to the stores. The sleek lobby is decorated with some remarkable remnants of the island's tradition. The hotel is located right upon the bay of Milos Island and offers you true Melian experience and the best hospitality.